is to help increase the value of your community. 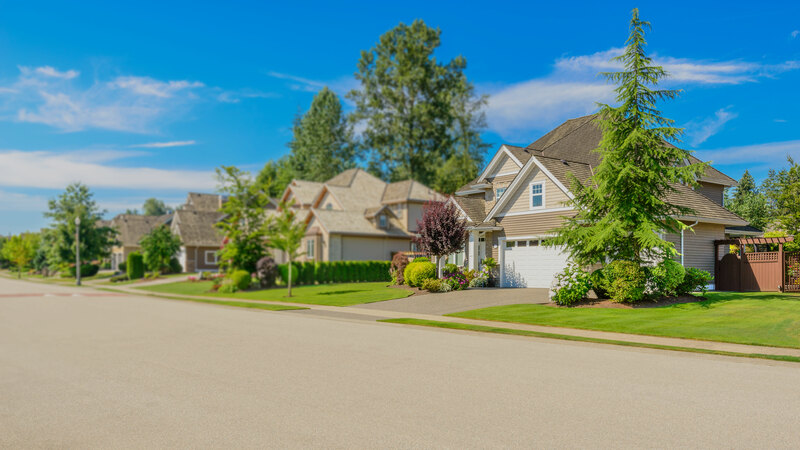 Both Board Members and the homeowners of an HOA community have ongoing questions and needs. 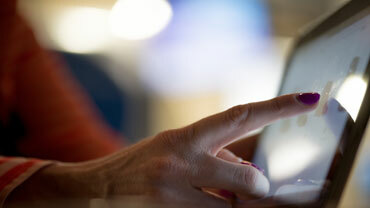 ACS provides each of our clients a full-service website that serves as yet another line of communication. After all, communication is the key to satisfied homeowners. With all the demands placed on HOA boards and members, the hassles and obstacles that arise can be overwhelming or at the very least frustrating. 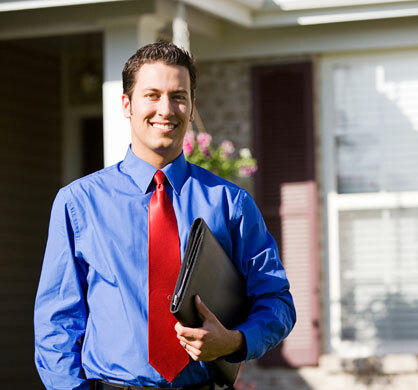 ACS professionals implement proven yet flexible systems that resolve all HOA concerns. ACS's main priority in managing your HOA is to help increase the value of your community. ACS employees know numerous ways to help your HOA achieve this goal. One key asset we provide is a Community Manager that helps the board members (and all members, for that matter) handle the day-to-day needs of your HOA. In addition, our Community Managers increase the harmony of your community. We strive to build a social structure that involves everyone by dealing with misinterpretations and other matters that are bound to cause strife within an otherwise well-run community. An enjoyable, sociable community does wonders for the value of your property. Community Action Items is a private forum homeowners use to report issues, complaints, make suggestions, personal requests and any other important communication that the board should handle. Action items create a location for board members to oversee communication with homeowners, community managers progress on tasks and projects, and a place to take care of items between meetings. ACS utilizes a transparent monthly reporting cycle that is prepared and presented to board members at each board meeting. These reports are easily customizable and readily available to all board members. Board members are truly in charge of HOA finances. The community manager assigned to your HOA is one of your key assets. He or she helps all members, including board members, handle the day-to-day needs of your HOA. 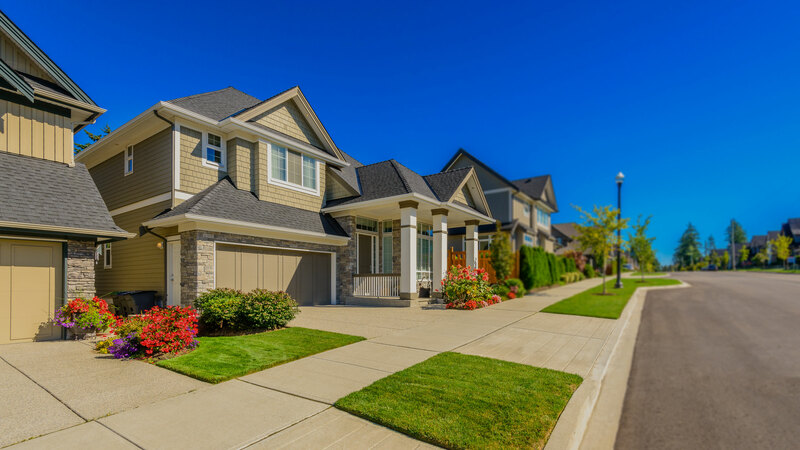 From paying bills and working with vendors, to the beautification of your property and maintaining compliance with governing documents, the community manager will help bring continuity and stability to your HOA. An HOA is a 24/7/365 operation, and you need a managerial staff that will take care of your needs at any moment's notice. 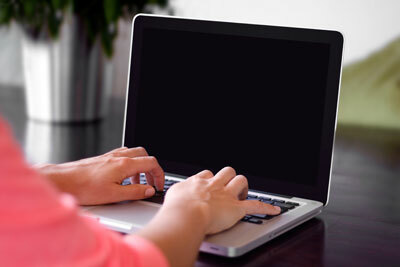 Your community manager is available at any time of the day to help with emergencies. We use a customized, patented software program specific to HOAs and phone systems that connect each of office. These systems are backed up each night to ensure your digital documents and information are secure. All systems are accessible from any of our offices and allow all members of your community. We strive to build a social structure that involves everyone by dealing with misinterpretations and other matters that are bound to cause strife within an otherwise smooth-running community. 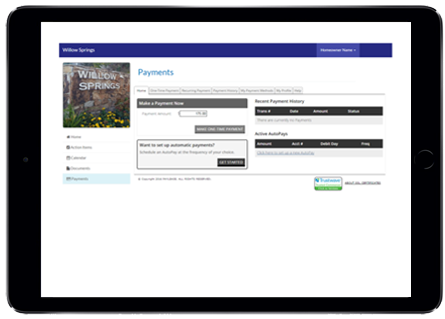 Multiple tools at your fingertips for sending and receiving information with homeowners, board members and vendors. 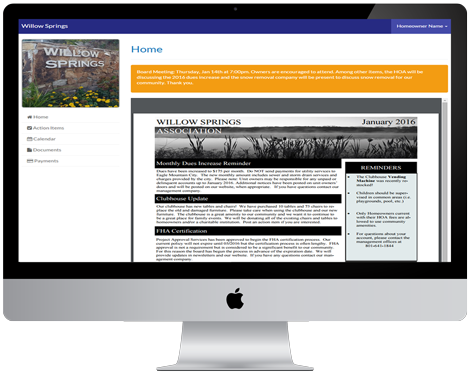 The community calendar and newsletters makes information readily available. All members are allowed to update these items to reflect meeting dates, reservations, landscaping schedules, etc. Communicate directly with owners to inform them of power outages, water shutoffs, annual meetings or important information owners may need to receive immediately. We were previously self-managed and hiring ACS has done wonders for our community. They have helped us through redoing our rules and making sure we are up-to-date on new rules and laws that affect HOAs.They have also helped us with negotiating vendor contracts to ensure we are getting the best deals. In fact, they noticed a discrepancy in our Comcast billing right away and not only did they get our monthly bulk bill reduced by $300 per month, but they also got the HOA a refund of over $13,000.00 by reviewing our initial contract.The refund alone will pay for their management fees for the next 2 years! These are just a couple highlights of many benefits we receive from ACS. I strongly recommend their services for any community. After changing management companies to ACS our HOA has seen a dramatic increase in service while saving the HOA tens of thousands of dollars.We went from barely having funds to pay the HOA bills to having a healthy reserve all without changing our dues.Their website provides a great communication tool for our homeowners to report issues and provides an easy way to keep track of all of the tasks they are accomplishing for us.The website keeps all of the HOA information in one spot which makes it easy for board members to keep track of everything that is going on in the community at a quick glance.With their patented communication tools we are confident that ACS will take care of every homeowner as they interact with the HOA regarding their largest investment. 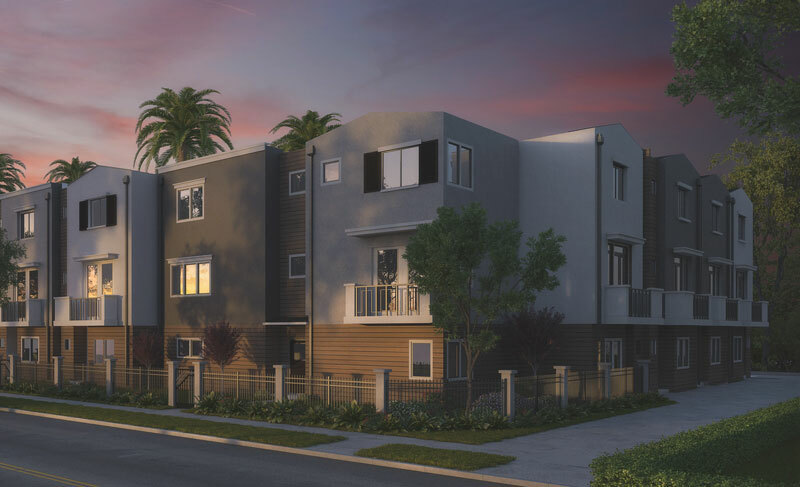 As the owner of several rental units St. George, I have interacted with most of the local property managers over the last few years.ACS stands head and shoulders above the rest. ACS has done a superior job, in less than a year's time, of substantially improving the physical facilities at Black Rock, creating transparent financial reports and generating clear and timely communications to homeowners. As the current HOA Chairperson at Black Rock, I can confidently endorse ACS and its local representative, Jeff Quayle. Our HOA looks forward to a long and mutually beneficial partnership with ACS and Jeff. ACS was there for us when our in house manager of 13 years quit without notice. Our Board was new and over whelmed. ACS helped us to put our HOA back on track. It's been 10 months since we hired ACS and our HOA has accomplished so much with Jeremy Johnson's help and guidance. Our board has been very pleased with the management of our community by ACS.They are responsive to our needs and our finances have improved substantially since we hired them. For example, after reviewing our trash removal contract, they were able to negotiate our monthly bill down to almost half of the previous total.They provide training to board members on our duties and responsibilities and explain the new laws and how they affect us. Managing our property is more than just a job for ACS.They definitely go above and beyond the regular expectation of a property management company.They genuinely care about the well-being of our community, just as they would treat their own property, and we truly get an advanced service.We highly recommend their services. Please contact or use our online form. 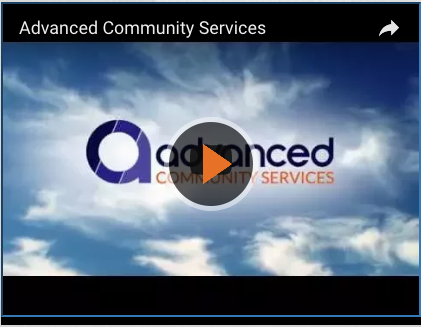 Advanced Community Services (or ACS) was created due to a recognized need in the property management industry for more professional and efficient service. ACS is founded on basic managerial principles that are often lost within associations. Copyright © Advanced Community Services 2015. All rights reserved.